Twins can occur naturally in any woman at any time. However, there are certain factors that increase your chances of having twins. • Having a maternal history of twins or other multiple births increases your chance of becoming pregnant with twins considerably. • People of African American descent are more likely to have twins or multiple births. People of Asian or Hispanic descent are less likely to have twins. • Your chances of having twins increases as you grow older. Women produce more ovulation-stimulating hormone as they age, increasing your chance of releasing more than one egg during ovulation. The chance of having twins rises to 4% between the ages of 30 and 34, and to 5% between the ages of 35 and 39. 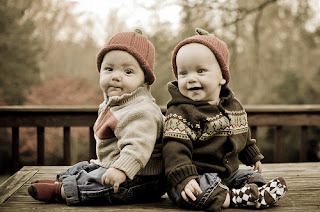 • If you’ve already had twins, it is more likely that you will have another twin pregnancy. • Women who have had four or more previous pregnancies are the most likely to have twins. • Taking fertility drugs or undergoing fertility treatments can significantly increase your chances of having twins or another type of multiple births. In some cases, women can increase their chances of having twins by up to 20%. • A study by the American College of Obstetrics and Gynecology linked the recent rise in multiple births with the steady rise of obesity in North America. Women with a body mass index (BMI) over 30 are more likely to have twins than those in the suggested BMI range of 19 to 25. • So, are there any proven methods to increase your chances of having twins? Well, there are a number of ways that you can go about trying to have twins, but, as with anything, there are no guarantees. Having twins is mostly down to luck, although there are a few things you can do to help Lady Luck along. • Women who are well nourished are more likely to have twins or multiple births. So focus on eating well and eating enough to maintain a healthy weight. • Yams, a type of sweet potato, have also been linked with multiple births. A tribe in Africa whose diet consists mostly of yams was recently found to have exceptionally high rates of twins and multiple births. Yams are thought to contain chemicals that stimulate hyperovulation, increasing your chances of conceiving twins. • Though not recommended unless you are suffering from fertility issues, fertility drugs do seem to greatly increase your chances of having twins. The fertility drug clomiphene (Clomid) increases your likelihood to 8%, while menotropins (Pergonal) increases your likelihood to 18%. Fertility drugs do cause side effects though and should never be taken without the supervision of a medical doctor. • Fertility treatments are also associated with higher rates of multiple births. In-vitro fertilization involves implanting more than one embryo into your uterus, which means you are more likely to conceive twins or higher-order multiples. Like fertility drugs, fertility treatments should not be undergone without approval from a medical doctor and are usually reserved for couples who are having difficulties conceiving.